1 of 4 In a medium-size heavy-bottom saucepan, stir together 3/4 cup water and sugar. Bring to a boil over medium-high heat. Boil for 1 minute. Turn off heat and stir until sugar is dissolved. Allow to cool. 2 of 4 In a food processor, puree the strawberries and soda. Add in the sugar syrup and process until combined. Pour into a 13 x 9 x 2-inch metal baking pan and freeze for 4 to 4-1/2 hours, until frozen solid. 3 of 4 Scrape into a food processor and process briefly until smooth but not melted. Spoon back into metal pan and freeze for an additional 1 to 2 hours before serving. 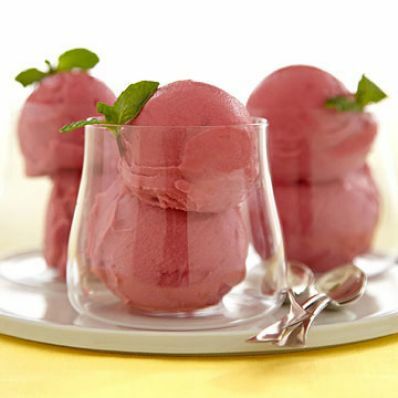 4 of 4 Form into balls with an ice cream scoop; serve in dessert dishes with chocolate wafers or mint leaves, if desired.